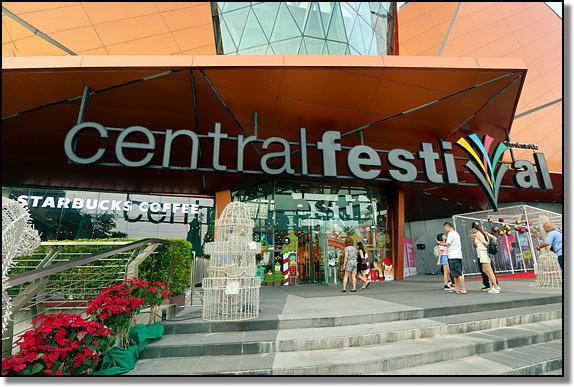 On this page I have provided a general description and some basic information about Central Festival in Hat Yai. Further pages give store directory listings and information for each floor. If you have any suggestions to improve these pages, please let me know. Since opening in December 2013, the Hat Yai branch of Central Festival (the largest shopping mall in southern Thailand) has had a profound effect on the town. Prior to its opening, Lee Gardens Plaza was the focal point for retail and tourism in Hat Yai. It was where retailers and restaurants wanted to be located, it was where tourists visiting Hat Yai wanted to stay, and it was where local teenagers used to like to hang out. That all changed after Central Festival. Nowadays, the Lee Gardens Plaza area is just a shadow of its former self. Restaurant chains such as Fuji and Sizzler no longer have a presence in Lee Gardens Plaza, but they have opened new branches inside Central Festival. The same applies to many retail stores that used to be located in Lee Gardens Plaza or elsewhere in downtown Hat Yai. Many businesses simply moved to Central Festival. In addition to all the retail stores and restaurants inside the mall, there are also entertainment venues that include a large cinema, bowling lanes, an amusement arcade, and even an ice skating rink. Yes, you can now go ice-skating in tropical southern Thailand. 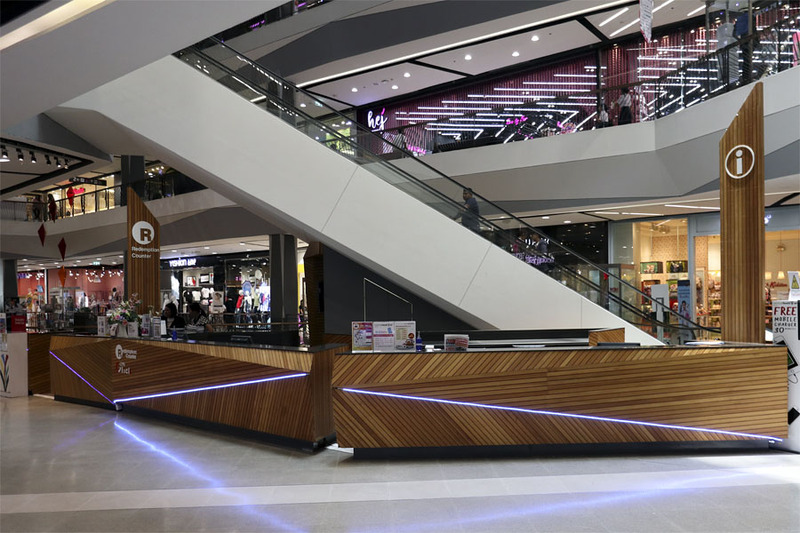 Considering that there is so much on offer, and that everything can be enjoyed in air-conditioned comfort, it is no surprise that this huge shopping centre has been an incredible success. Not only is it popular with Hat Yai residents, but it is also popular with Thais from many other southern provinces and it even attracts shoppers from Malaysia and Singapore. As Central Festival has become more popular, the surrounding area has seen a lot of development and many new hotels have been built for tourists who want to stay close by. I have been to Central Festival Hat Yai many times and the TOPS supermarket branch inside is where we do our regular grocery shopping. The information I have provided about shopping, eating and free shuttle services is to help those people who aren't quite as familiar with the mall. I hope that this information helps you. If not, please let me know if there is anything I can add to make the information more helpful. Although I have been visiting Central Festival in Hat Yai since it first opened in 2013, I only added this information to my website in December 2017. The original information was a snapshot of the situation at the end of 2017. Whenever I notice that anything has changed I update this information, but I can't guarantee that it will always be correct. I am always grateful when readers notify me of any errors. Central Festival is where all retailers in Hat Yai want to be, but it doesn't always work out - even for big companies. Marks & Spencer are a huge retailer in the UK, but the M&S outlet at Central Festival didn't last very long. Brits like M&S for the tasty ready-made meals, but there was no food for sale at M&S in Central Festival Hat Yai. There were only clothes for sale and M&S clothes don't tend to be that popular. In Thailand the traditional markets open very early in the morning, but department stores tend to open late and close late. Central Festival Hat Yai is no exception. The information centre is located on Floor 1. It is staffed by pleasant, young Thais who speak English. They will be able to answer any questions you may have about the mall and they can also call a taxi to get you back to your hotel. The taxi stand is located on Floor 1 at the front of the building. There are also free information brochures available. There is a small lounge with free Wi-Fi, which is only open to foreign tourists. 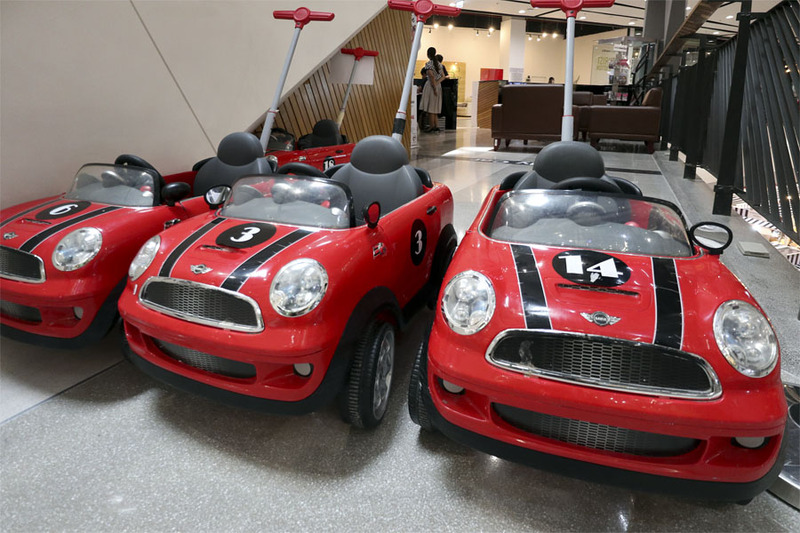 The information centre is also where you can borrow wheelchairs, baby strollers, and kiddie cars for slightly older children. Simply leave some identification and you can use any of these things for free while at the mall. Cart Assistance: Customers with mobility problems are taken around the shopping center. Mobile Charger: You can charge your mobile phone for 30 minutes or less. Breastfeeding Lounge: This is located on Floor 4 and there are also nappy (diaper) changing facilities. Post Office: A Thailand Postal Service office is located on Floor G.
Prayer Room: Prayer rooms for Muslim customers are located on floors 2 and 3. Shop at any store displaying a VAT Refund sign and ask for a P.P.10 form and original tax invoices for purchases of at least Bt2,000 per store per day. Total purchases must be in excess of Bt5,000 per person (VAT included) to qualify for a VAT refund. Before loading your luggage at the International Airport, show your purchases at the Customs Office. Submit the P.P.10 form and all of the original tax invoices to collect your refund at the VAT Refund Office after passport control. Luxury goods, such as jewelry, gold ornaments, watches, glasses and pens with a value of Bt10,000 or more must be shown once again at the VAT Refund Office. If you are only in Hat Yai for a short time you may not be able to choose when you visit and it also depends on your own personal preferences. However, if you can choose, here are a few of my own thoughts. Thais seem to like busy, crowded places, whereas I don't. On Saturdays and Sundays Central Festival is absolutely heaving. Thais go there for entertainment and eating as well as shopping, and weekends is when many Malaysian and Singaporean tourists visit Hat Yai. Because this is the largest shopping mall in southern Thailand, Thais from many other southern provinces come to visit - not just local Thais from Songkhla province. Thais do not like hot weather and they love air-conditioned shopping malls, which is another reason why they go in their spare time. If you arrive late at the weekend it can also be very difficult to park, even though there are thousands of car parking spaces. I therefore try to avoid the place at weekends and find that it is much more civilised during the daytime from Monday to Friday. I normally try to arrive at around 10:45, just before the mall opens. I can park easily and I don't have to contend with crowds of shoppers. During the day it is generally very relaxed, but it can get busy in the evenings when people go to the mall after work or school. If the primary reason for your visit to Hat Yai is to spend time at Central Festival I would advise staying at a hotel nearby. See Ten Places To Stay Near Central Festival. 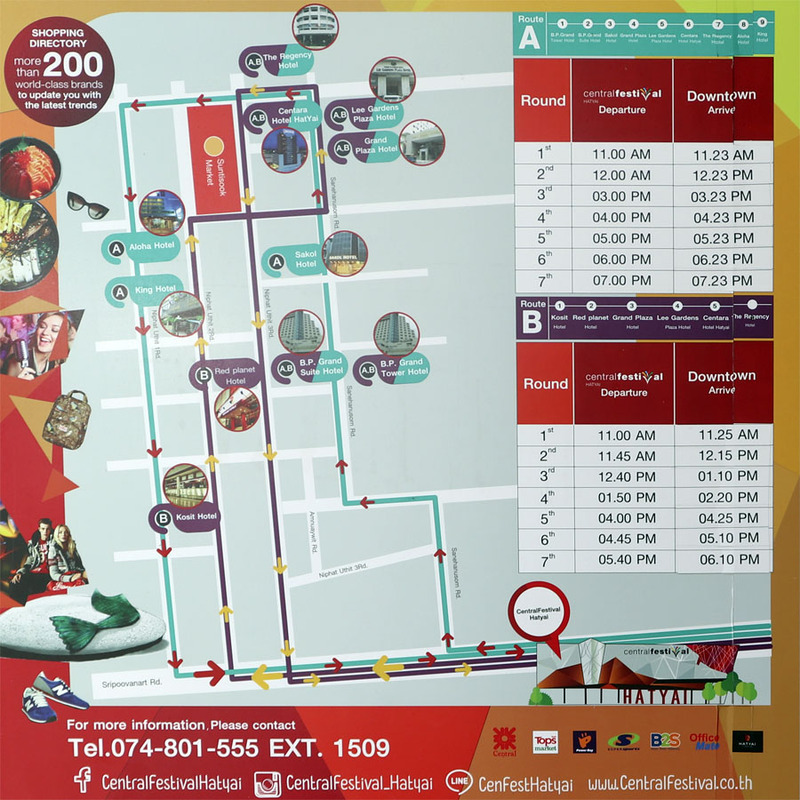 However, if you prefer staying in the downtown area of Hat Yai it isn't difficult getting to Central Festival. Many of the sawng-thaews (converted pickup trucks that carry passengers) that go along Phetkasem Road go to Central Festival and the fare is only Bt10. They will drop you off in front of Makro where there is a pedestrian bridge that leads straight into the mall. Some hotels close to Central Festival offer a free shuttle service taking guests to the mall. From the downtown area there is a free shuttle service that will take you to the mall and bring you back to your hotel again. The following graphic gives information about this service, but if you are unsure just ask the staff at your hotel front desk. The Route A shuttle picks up guests from the following hotels and then goes to Central Festival: BP Grand Tower, BP Grand Suite, Sakol, Grand Plaza, Lee Gardens Plaza, Centara, Regency, Aloha, Kings. The Route B shuttle picks up guests from the following hotels and then goes to Central Festival: Kosit, Red Planet, Grand Plaza, Lee Gardens, Centara, Regency. Even if you aren't actually staying at one of these hotels just go along to the hotel that is most convenient for you at the appropriate time to catch the shuttle. 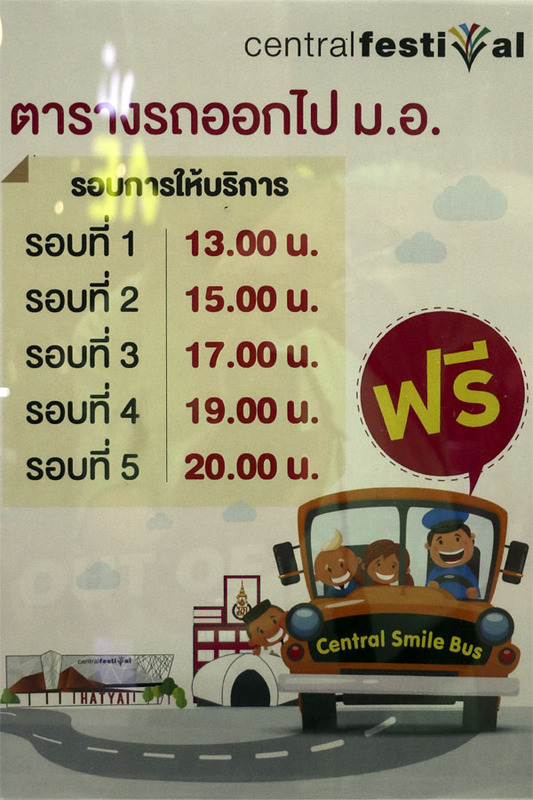 The shuttle service between Central Festival and downtown Hat Yai is well known, but there is also a free shuttle service that goes between Central Festival and the Prince of Songkla University (known locally as Mor Or). Five services a day leave Central Festival at 13:00, 15:00, 17:00, 19:00 and 20:00 and then return. I haven't used this service, but am told the vehicle resembles a large tuk-tuk. Once you are inside Central Festival, you have everything you need and there is no need to leave. Most restaurants are located on floors 4 and 5. If you want to eat inexpensively there is a Food Park on Floor 4. You won't find any Michelin rated restaurants at the Food Park, but the food isn't bad and it's fairly cheap. I always enjoy the Chiang Mai style Kaaw Soy chicken noodles, which cost around Bt60. On Floor G in front of TOPS supermarket there is another, smaller food court and you can also buy ready-to-eat food from TOPS, which you can eat at one of the tables in the food court. As with most eating establishments in Hat Yai, restaurants cater mainly to Asian tastes. On Floor G there used to be a kebab shop and a sandwich shops, but both shops disappeared. In addition to their own food, Thais also like Japanese and Korean food. Therefore, you will also find Japanese and Korean restaurants inside Central Festival. There are branches of McDonalds and KFC on Floor G if you need a fast-food fix. Massage is synonymous with Thailand and there are massage shops everywhere in Thailand, right? Well, there are some exceptions and Hat Yai's branch of Central Festival seems to be one of them. I can't actually recall seeing a massage shop inside the shopping mall. It's a shame because you tend to do a lot of walking on shopping trips and after a lot of walking a foot massage can be very refreshing. I would imagine that it's because of the very high retail unit rental rates in Central Festival. In Hat Yai the going rate for a foot massage is Bt200. This isn't very much, but a business can still make a profit if the rent on the shop is low. However, if it costs a lot of money to rent a shop and people still expect to pay only Bt200 for a foot massage there probably isn't a business model. The entire back end of Central Festival is given over to Central department store on multiple floors. The goods in Central department store are high quality, but generally quite expensive. Having said that, there are regular promotions and it is possible to find high quality items for the same price as you would pay at a traditional Thai market. The difference is that the local markets offer no guarantees and vendors at these places have no sense of customer service, whereas if you buy something at Central you will get a proper warranty if there is a problem. When I shop with my wife we spend quite a lot time checking and comparing prices. Although Central has a reputation for being expensive, sometimes it is the cheapest place to buy something. It's always worth a look. Outside of Central department store, the Central Festival mall is made up of hundreds of individual units of varying size that are rented out by external businesses and shops. These businesses and shops are listed below by category and clicking on the floor number will take you to a list of businesses on that floor. I try to keep this list up to date, but everything changes often and the current version may not be completely accurate. On floor 1 there is also a Market Place, which is further sub-divided into more small units that sell clothes, shoes and cosmetics. Click on the links for a floor-by-floor guide to individual businesses operating inside Central Festival, Hat Yai.